After living in Japan for a while, you kind of get used to all the things that used to excite you so much at first. But every once in a while, you get what I like to call the ‘hello-you’re-in-japan-face-slap’. Today I will tell you about one of those faceslap moments that stand out in my memory. It happened when I was browsing a local fabric store with a friend. A visit to the fabric store is an event already exciting in itself, because of the multitude of gorgeous Japanese fabrics everywhere. 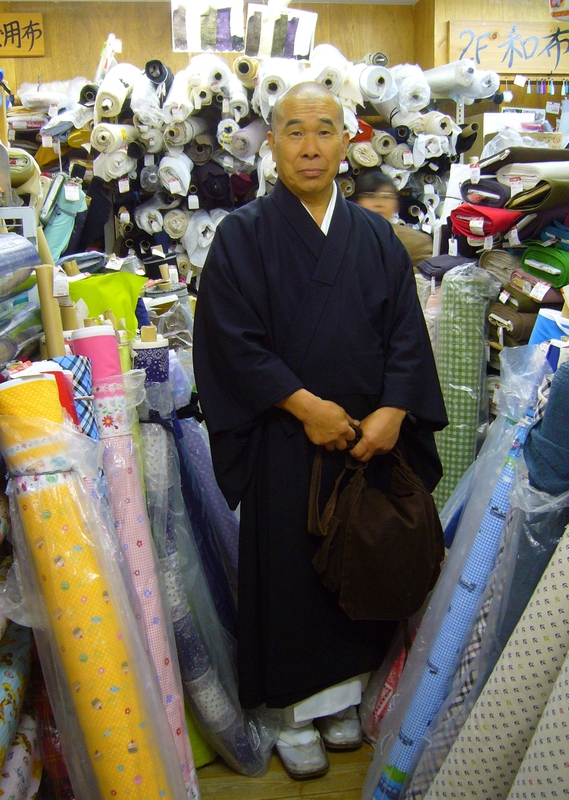 But suddenly, in the midst of the housewives and rolls of fabric, we saw a Zen monk in traditional robes. The monk was just going about his business, looking at different fabrics. I’m sure he wasn’t expecting to be ambushed by an overly excited gaijin, asking him if she could please be allowed to take his picture because she never saw a monk in a fabric store before. But true to his zen background, he remained unfazed and kindly posed for a picture. The result is one of my favourite images from Japan! Look how calmly he is standing there amid the colourful fabric. For me, this image says more than a thousand words. This entry was posted in Culture, Fashion, Japan, People watching and tagged Clothing, Fabrics, Face slap moments, Impressions of daily life, Japanese culture, Japanese monk, Monk, Old meets new, People watching, Shopping, Traditional Japan, Zen, Zen monk by Haruko-chan. Bookmark the permalink. i can’t help but to focus on his clogs. is that a see-though cover over the clogs? I hadn’t noticed! You have a good eye! When shopping for my kimono supplies, I did see similar covers to wear with zori (kimono shoes). They are meant to keep your tabi (white socks) clean on a rainy day. oooo i see. never knew that. Awesome! I love it — faceslap moment. Do you ever get any ‘I’m in Australia!’ faceslap moments? We didn’t ask him what he was looking for. We were already a bit nervous about asking for the picture and the monk did not seem too chatty. My guess is he needed fabric to make some item for daily use. Monks are people too of course, with sometimes surprisingly regular lives I think. That bag he is holding, for example, looks like it could be home made. But the fabric he was looking at when we asked for the picture, was the green and white checkered fabric in the background, so that’s a bit flashy for a zen monk’s bag. A pillow case perhaps? A table cloth? Curtains? We often get taken back when we encounter people outside of their traditional settings. I love this shot!